TORONTO , Feb. 26, 2019 /CNW/ - Sable Resources (SAE.V) (the "Company" or "Sable") is pleased to announce the completion of Phase II, drill target definition work at the Scorpius Project located in the Miocene Gold Belt of Peru . The exploration included detailed mapping of a 4 km2 area, collection of 49 rock samples that add to the 524 previous rock samples results provided by the tenement holder, and 4 kilometers of Induced Polarization (IP) survey distributed across 4 lines. The objective of the rock sampling was to evaluate the surface gold geochemical values associated to the different lithological units and alteration mineral assemblages. Gold values from the 49 rock samples grade up to 4.91 g/t with 19 of the sample in the 0.1 to 1g/t range. Best gold values are associated with silica-alunite alteration, silicification, and vuggy silica. Historic samples provided by the tenement holder include gold values up to 7.75 g/t, including 90 samples grading between 0.1 to 1 g/t, and 23 samples grading more than 1 g/t. The IP survey covered a total of 4 km distributed in three lines oriented perpendicular to the alteration corridor and one parallel. All lines identified a robust high-resistivity anomaly, at least 1000 m long on the E-W direction, 500 to 600 m wide, and 100 to 130 m thick, with the top of the resistivity high occurring from between the current surface and 100 m depth. 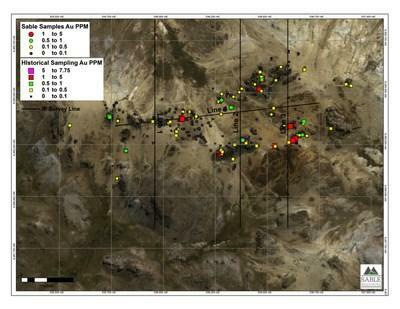 The robust gold anomaly accompanying the typical high-sulphidation mineral assemblage within and at the margins of domes with low levels of erosion, all coincident with high resistivity anomalies, clearly justify to move forward with the first drill test at Scorpius, testing the potential to host an open-pitable, heap-leaching deposit typical of the Miocene Gold Belt of Peru . In parallel with the Phase 2 work the company initiated negotiations with local communities, and completed all necessary field and administrative work required to request the environmental permit to conduct drilling. Sable expects to have all permits ready on time to commence drilling during the Peruvian Andes dry season early in Q3, 2019. Sable Resources Ltd has granted a total of 450,000 incentive stock options to an officer and director of the Company pursuant to the Company's Stock Option Plan. Such options are exercisable at a price of $0.25 for a period of five years. The grant of options is subject to the approval and requirements of the TSX Venture Exchange.